New movie trailers for Interstellar, Exodus: Gods and Kings, and Taken 3 debuted this week. Watch them below. As I mentioned last week, there’s also a new Interstellar game you can play. It’s wild that this movie is coming out so soon. For more information about this movie—including a parody of Charlton Heston playing Moses, a Ferris Beuller reference, and the historicity of the exodus—click here. 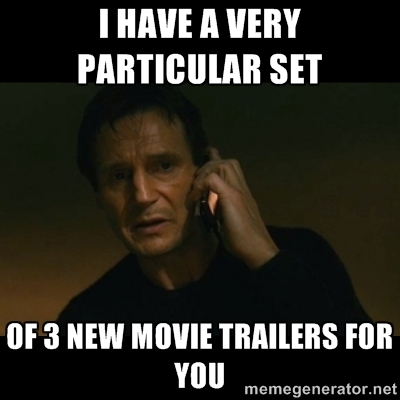 Who’s surprised that there’s a third Taken movie? If you can’t get enough of Liam Neeson, I have good news for you. You can check out a video of him doing improv comedy with Ricky Gervais. If that’s not enough, you can watch a ten hour video of him staring at you. That’s a good way to kill some time. What do you think about these trailers? 1) Whoa, Bruce Wayne / Batman is Moses! It’s a stretch, since there are few parallels besides the orphan thing, but an interesting casting choice nonetheless. I hope this movie’s portrayal of the 10 plagues of Egypt lives up to the 1999 version of “The Mummy” starring Brendan Fraser. 3) Although the creators of Taken are pretty much milking the franchise by this point, I can appreciate them taking a chance on a new plot angle, and at the end of the day, I’m still a sucker for a good Liam Neeson action flick (much like a good Arnold action flick). 1) Excellent Brendan Fraser reference. I guess you could say that reference was a real Blast from the Past. 2) That Batman/Moses video is hilarious. Interstellar is gonna be tiiiiiight. I’m gonna be kind of bummed if they don’t work “Stellar” by Incubus. I’ll be kind of bummed if they don’t work in Stellar Kart.